True authority in science comes from the data. That was the point of the Enlightenment. Reason and empiricism triumphed over superstition and abuse by church and state, people learned to trust data ahead of any human authority, and science was born. Empirical data became the highest authority in physics, chemistry, and biology. But in modern climate science the mainstream media and most politicians go to the government climate scientists as their highest authority, not to the data. 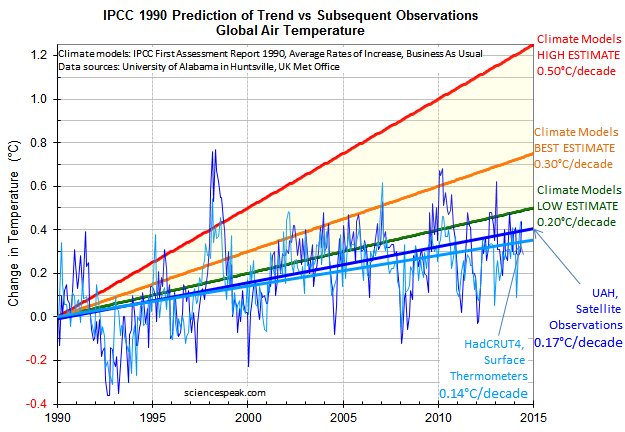 Sure the climate scientists show them some data, but only the convenient data. For a theory to be true it has to agree with all the data. With the Internet it is easy to bypass the authorities and go directly to the data itself, but the old media isn’t doing that yet. Can downloading a file of numbers, reading it into a spreadsheet, and graphing it, really be too hard for the mainstream media, or is there some reason they don’t want to? We don’t hold official government positions, so our authority derives from the data. No newspaper, or Internet arm of government such as the ABC’s Drum, ever publishes the data we want them to. It’s as if they don’t want us to be too credible or too convincing. No Smoking Hotspot by David, in The Australian, which became widely quoted. The media coverage of the Garnaut report in Australia showed that our decision makers and the public had no idea that the evidence about the causes of global warming had evolved considerably. David wrote to a few politicians to point out the problems, and at the urging of one he wrote this article. Jul 2008. The Silent Undercurrent of Skepticism by Joanne, in The Spectator. Apr 2010. A Journalist Who Confuses Journalism with Propaganda by Joanne, in The Australian. Dec 2010. Climate Models Go Cold by David, in The Financial Post of Canada. Reports a speech David gave to a “No Carbon Tax” protest in Perth. Two-thirds of the temperature rises predicted by the theory of man-made global warming rely on a guess made in 1980 about moist air, that was proven false by empirical evidence by the late ’90s. Apr 2011. On Climate Change, the Wrong Choice Kills People Either Way by Joanne, in The Australian. May 2011. We Need a Free Market in Climate Science by Joanne, in The Australian. Jul 2011. Climate Change Science is a Load of Hot Air and Warmists are Wrong by David, in The Age. Most of the warming in the theory of manmade global warming comes from assumed changes in humidity and clouds, NOT from carbon dioxide as widely believed. And the climate models are doing really poorly. Aug 2012. Jo Nova in The Australian: Manne is Anti-Science on Climate by Joanne, in The Australian. Aug 2012. Jo Nova in The Australian: Carbon Credits Market is Neither Free Nor Worth Anything by Joanne, in The Australian. Jul 2013. Three Cheers for Senate Micros by Joanne, in The Australian. Sep 2013.